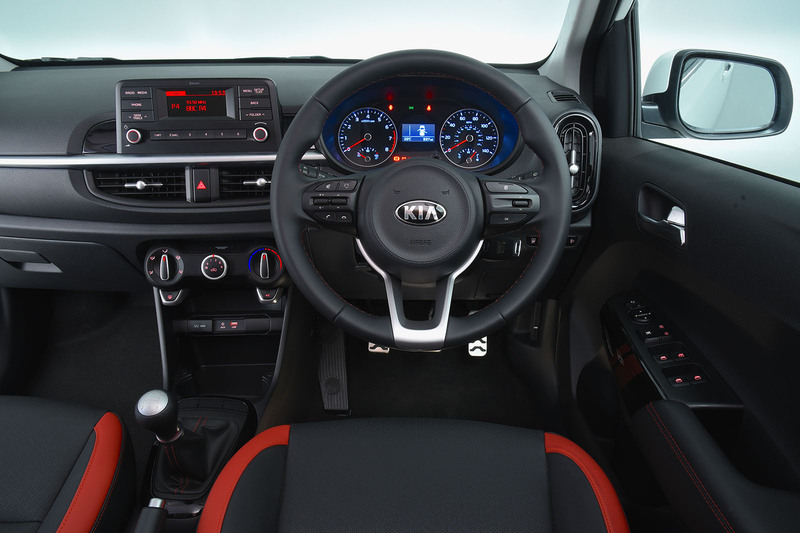 The new Kia Picanto is a small car, and a big deal for Kia. The previous two generations have been big sellers - and very well regarded - but Kia faces a big challenge to hold its own in the increasingly crowded city car market. We’ve previously driven the new Picanto with its GT-Line finery on, but this is our first outing in the final UK specification on British roads. The GT-Line’s sporty styling certainly stands out, with 16-inch alloy wheels, chunky front and rear bumpers, and even a twin exhaust. Does an 83bhp Picanto really need a twin exhaust? Kia clearly hopes the style-conscious young buyers it’s targeting will think it does. Those young buyers might be a little less impressed with the interior spec. The Picanto is available in the UK in five trim levels – 1, 2, 3, GT-Line and GT-Line S. Oddly, aside from the styling cues, the GT-Line’s tech is based on the mid-level 2 trim. That means the GT-Line features black and red faux leather seats and stainless steel pedals – but doesn’t get the 7.0in colour touchscreen available on the 3 and GT-Line S. The system that GT-Line does get features Bluetooth, but you suspect smartphone-savvy 20-somethings might prize the built-in sat nav and Apple CarPlay in 3 trim as much as, if not more than, shiny metal pedals. 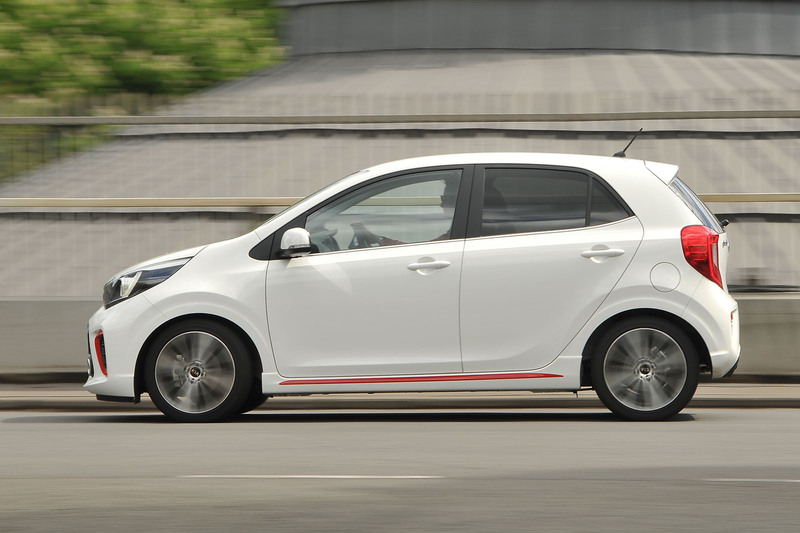 Regardless of which trim level you go for, the third-generation Picanto features a revised, lighter bodyshell with a longer wheelbase and greater torsional stiffness. Notably, for a city car, an autonomous emergency braking system is standard on all models. In the city, the new Picanto excels, living up to the reputation of its predecessors. Visibility is great all round – there seems little need for the rear parking sensor and cameras available on higher trim levels – and it’s responsive and manoeuvrable. 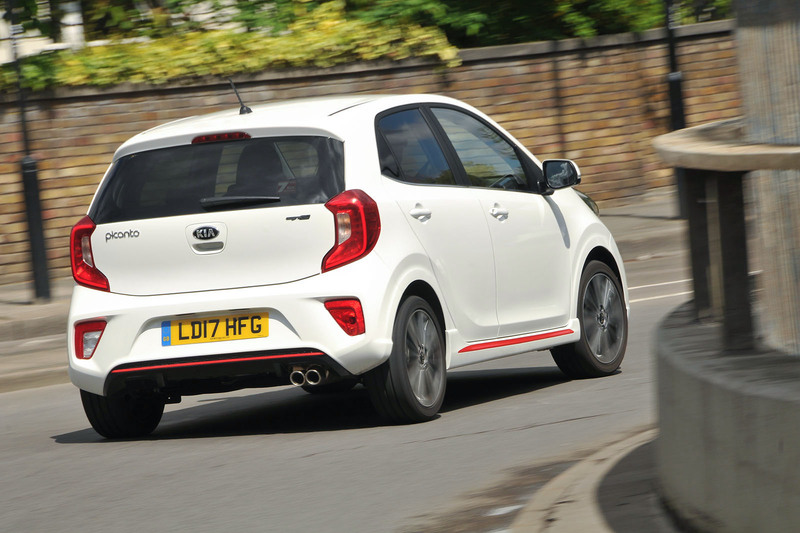 At low speeds, the ride can occasionally suffer on our particularly rough UK roads or speed bumps, but take to faster, more flowing roads and the Picanto is surprisingly engaging. The steering is light but precise, and it’s stable enough to be good fun on twisty B-roads. The 83bhp, 1.2-litre engine is geared to provide ample power for stop-start city driving, and though not particularly quick to react, it isn’t found wanting at higher speeds. Those who want greater performance from their Picanto may want to wait for the 98bhp 1.0-litre turbocharged engine that's on its way. But this 1.2-litre engine is still flexible, and, when it's up to motorway speeds, the Picanto feels sure footed. It’s not a car you’d want to take extended journeys in regularly, but it’s definitely a city car that doesn't feel out of place heading out of town. It helps that it’s comfortable too. There’s plenty of space up front and it’s easy enough to get comfortable, despite lacking somewhat in seat and steering wheel adjustment options. The boot is a decent size too. The dashboard isn’t the most stylish in the world, and it doesn’t really fit with the stylised GT-Line trim. But all the key buttons are well laid-out and easy to reach and use. If you’re looking for an affordable small car, the Picanto is definitely worth considering – it’s a city car that can hold its own outside of its natural habitat. Whether you should choose the GT-Line probably depends on, well, whether you think an 83bhp Picanto really needs a twin exhaust. Splash out an extra £200 for the 3 trim and you’ll have a car that doesn’t look as sharp, but features a seven-inch touchscreen and a host of extra kit. The GT-Line S offers the best of both, but does cost an extra £2000. At that price though, the Picanto starts to look expensive next to its rivals. The Hyundai i10 and Volkswagen Up are the Picanto's closest competitors, and they both undercut the Kia's price while being similarly well-specced. So how does this differ from the Hyundai i10? Connectivity is great and near essential these days. Physical dials and buttons are much better controls to use in a car. What I want is software that links the two so I can use physical buttons to control the functions of my phone whilst driving. I just hope that the review is as amazing as the car is in real life. The price is not bad.. I like that. It looks pretty good apart from the rising waistline which takes far too much glass from the side windows, especially at the rear. If the bottom edge of the glass ran from the door mirrors keeping parallel to the ground it would be a far better car. Also comparing this car, it's Hyundai counterpart and the VW Up to something like the original Yaris of 1999, shows that while they are all roughly the same size the Yaris was about a hundred kilos lighter, and that's where today's cars really need to improve. Even the smallest of them are simply too heavy. The world needs fewer new cars, but those which are made need to be smaller and lighter, to both ease congestion and save resources. WOw! this car is awesome, i like the design and the looks of it. would like to ride this car one day. I think this a very good design IMO. Portable yet still stylish. Thumbs up!